Day 1 of the India vs England first test match swung India’s way after they ended up picking 6 English wickets for 62 runs. With the English innings sailing at one point at 213-6 courtesy of Joe Root and Jonny Bairstow, India needed something to change for them and change quickly. And it was Virat Kohli who brought about England’s collapse from a position of comfort after a brilliant throw by him saw Joe Root being run out to trigger England’s downfall and end the day in India’s favour. Winning the toss and choosing to bat first in Edgbaston looked to be the right decision for the England side. Despite Alastair Cook departing early on after being bamboozled by a Ravichandran Ashwin beauty, Jennings and Root steadied the English innings. They saw out the new ball cautiously, defending well in the first 20 overs on a pitch that was offering something for both the pacers and spinners. Unlucky to miss out on his half-century, Jennings (42) and Malan were both picked up in quick succession by come-back Indian fast bowler Mohammad Shami. However Root and Bairstow took command of the match from thereon to hand the pre and post lunch session in England’s favour. Despite Kohli shuffling his bowlers around, even brining on Ashwin for an early spell, he was unable to faze and trouble the English duo who kept caressing the ball all around the park. Stuck in a real pickle, unable to break the partnership, India got their breakthrough in the most unexpected of ways. 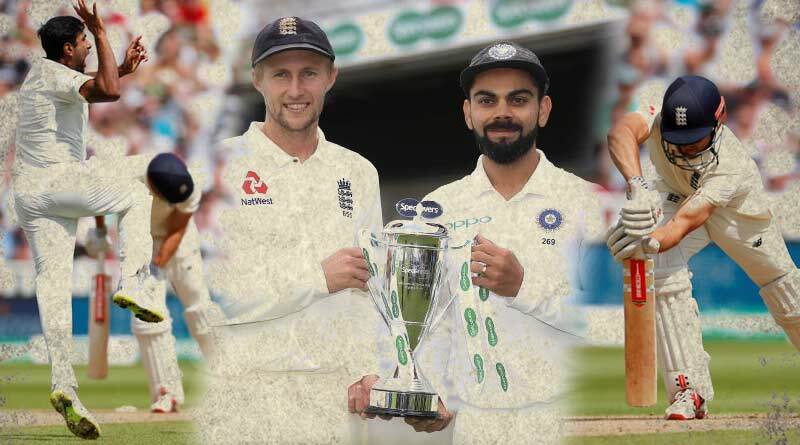 Taking on Kohli’s lightening quick arm proved to be costly for Root who was unable to make it back to his crease in time, ending a superb innings of 80 in an unfortunate manner. And Kohli is not one to forget quickly. With Root’s mic drop celebration after the third ODI fresh in his mind, Kohli was quick to replicate the celebration after running out Root to spark an Indian comeback in the test. Egged on by that vital wicket and Kohli’s celebration, the Indian bowlers went on an all out assault. The pace pair of Yadav and Sharma along with spinner Ashwin caused all sorts of problem to England, picking up 5 wickets in quick succession to end the hosts day reeling at 285-9 in the first test match. 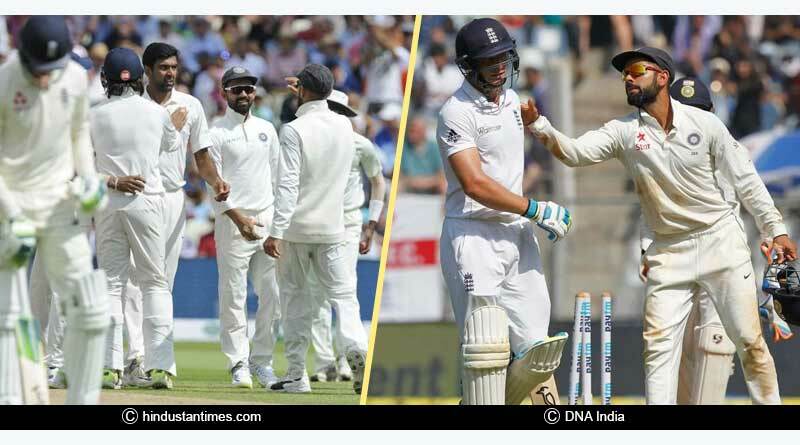 Do let us know if we missed any interesting moment in the India vs England first test match highlights.